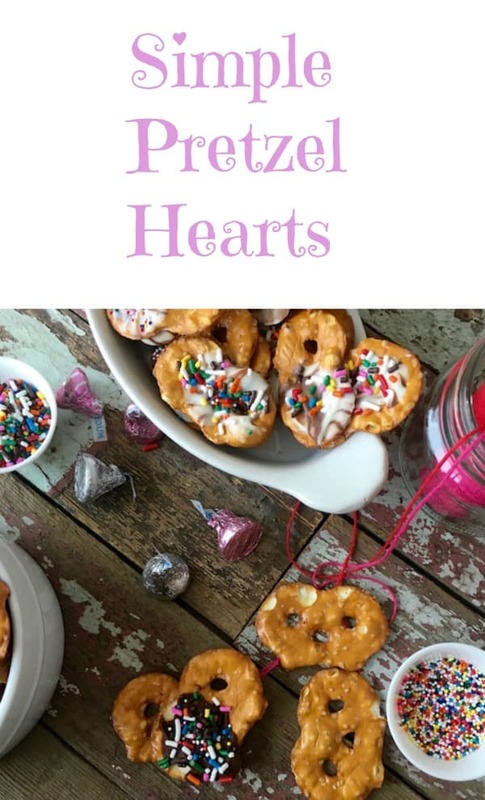 You can make these Simple Pretzel Hearts for Valentine’s Day OR ANY time of the year but I think they’re especially nice to make for Valentine’s Day treats. 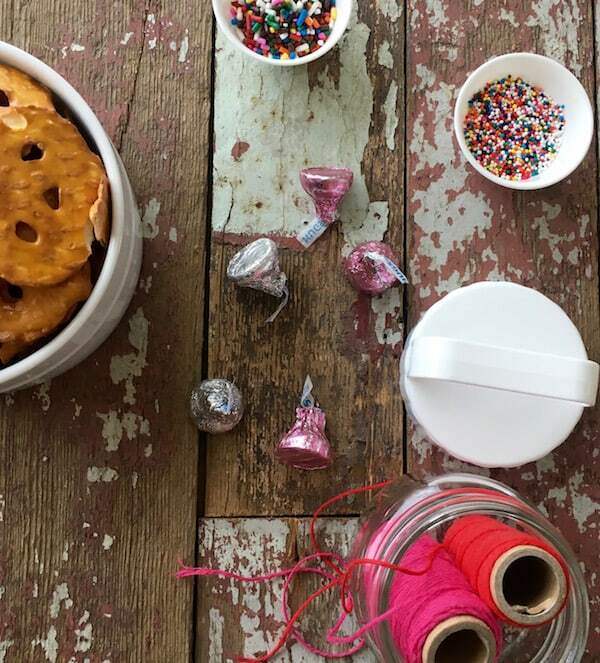 They’re super simple to make, kids of any age will enjoy working on them. Also? TASTY. And because we have a new Type One Diabetic around here, as in we have to count carbs (oops typed crabs! ), these were easy to add up in the carb division. 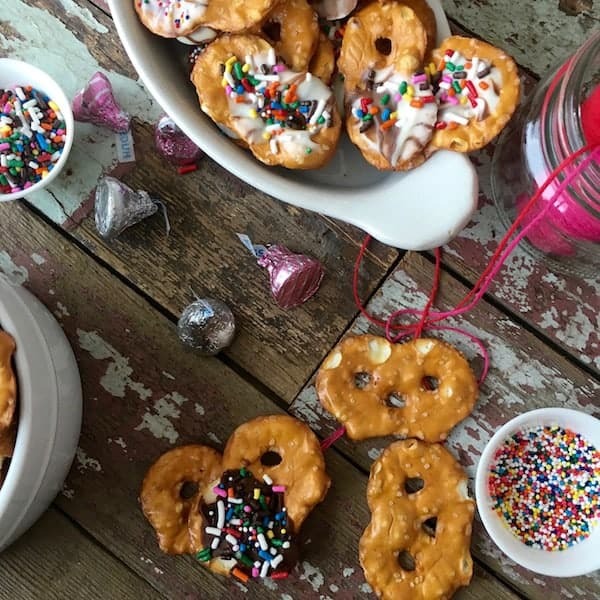 Obviously this is NOT how we plan to eat all the time but I think the thing that makes keeping an 11 year on track with eating is that you CAN have treats and these are fun as well. 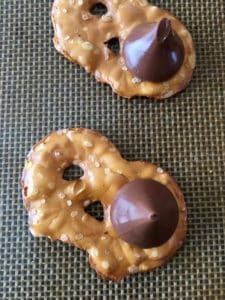 I don’t know about you but I always think that if my kids are going to hand out a treat it should be something they can actually help make. 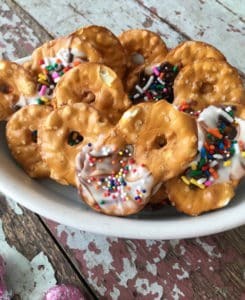 And these fit the bill, older kids can make them start to finish by themselves and younger ones will need a hand getting them in and out of the oven. Carbs for these were easy to calculate: you get 11 pretzel crisps for 22 carbs so each pair is 4 carbs for pretzels. And the kisses are roughly 2.66 grams carbs per kiss. Sprinkles are negligible. Total is 6.77 carbs per heart, for a total of 13.54 for two BUT because we work in carb units (15 grams of carbohydrates makes up one carb unit) we’ll be counting them as 2 for 15 grams or one carb unit. 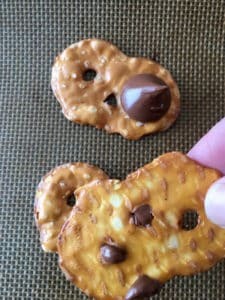 These super simple Valentine's Day treat feature two Pretzel Crisps and a Hershey's Kiss and they're easy enough for kids to make start to finish. And perfect for handing out as a little treat for Valentine's Day. 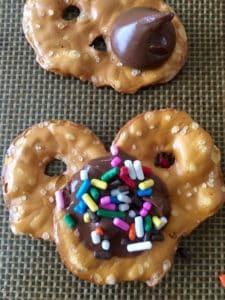 add sprinkles if desired, sea salt is also nice but probably not for kids? You can make these Simple Pretzel Hearts ANY time of the year but I think they're especially nice to make for Valentine's Day treats. They're super simple to make, kids of any age will enjoy working on them. Also? TASTY.